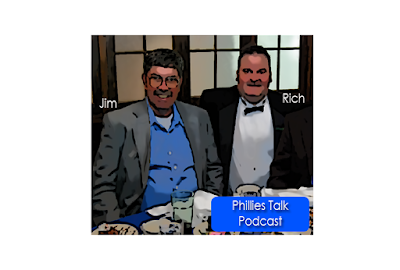 Phillies Talk Podcast lost a very important part of the broadcast team that made it up when Jim "Sports Dog" Mulry passed away on Friday at the age of 65 in Philadelphia. Listeners of the show really looked forward to listening to what Jimmy had to say about the current state of the team, and his love for baseball in general. His dedication to our listeners was really strong, he had been in somewhat poor health in the last couple years but he insisted on doing some shows even from his hospital bed a couple years ago. A listener often didn't know what he was doing the show from such tough circumstances. To get you up to speed on the history of the show, it was started back in 2006 when podcasting was just starting to get off the ground. Jim wasn't very tech oriented, in fact, he never owned a computer. All of his knowledge was up in his brain, and he enjoyed reading and learning all he could about baseball and sports in general. He was an avid fan of all sports from football, especially college, to golf to basketball. I met Jimmy at a job that we both worked at, we used to talk sports and I had an idea. Jim sounded like he had been in broadcasting, and indeed he had done several announcing duties over the years for various local sports projects. I decided to ask him if he'd like to try doing a sports podcast with me, and he said, "A what?" I had to tell him all about podcasting which was just starting to take off in 2006, I told him it was an internet broadcast that could be heard around the world by anyone with a computer, phone, or ipod that wanted to listen. He was in, and we started off doing all the major Philadelphia sports for about a year, before we decided to limit it to baseball, which was something we agreed on because of the love we had for the game. So that's a bit of history on how we started the show. Jim and his wife regularly made the rounds of local high school and college sports in the area. His idea of a great Friday night often included going to the local high school football games and supporting local sports, he was well known to athletic directors from all over the area. Phillies Talk Podcast will continue, I know Jim would have wanted the show to go on. For the next edition, I'll be releasing a bit of a retrospective on what he had done over the years. Some great interviews we did, some behind the scenes banter and some fun times we had while doing the show. I'll have it finished by the Memorial Day weekend, so stay tuned for it! If you never listened to the show, now you may have a good reason to want to tune in. You can subscribe on iTunes or Stitcher Radio, and listen from BaseballTalkRadio.com - which is the home for great baseball talk shows. God bless Jim, and may he rest in peace. The memories we had of doing the show and our friendship was legendary, we was almost like a brother that I never had.